Individuals and families requiring good levels of travel insurance cover for their holiday/trip. Children can travel independently e.g. on school trips – provided under Annual Multi-trip “Family” cover at no extra cost, subject to having the permission of their parent and/or guardian and be accompanied by a responsible adult. Please note: we cannot cover unaccompanied children. Students Extension (Annual Multi-trip cover only) for Channel Islands & Isle of Man residents – A child who is normally resident in the Channel Islands or the Isle of Man may commence a trip from their home area or a place of education in England, Scotland, Wales or Northern Ireland. An additional premium will apply. Scheduled Airline Failure & End Supplier Failure – provides cover up to £3,000 with Premier (up to £5,000 with Premier Plus) in the event the holiday/trip has to be cancelled due to the financial failure of your airline, travel or accommodation provider and you are unable to recover your pre-booked travel and accommodation costs elsewhere. Journey Disruption incl. Airspace Closure (automatically included with Premier Plus; available as an option with Essential and Premier at an additional premium) – cover for cancellation or additional expenses due to disruption caused by a natural disaster such as a volcanic eruption. Gadget cover (automatically included with Premier & Premier Plus) – provides up to £1,000 (Premier) or £1,500 (Premier Plus) for accidental loss, theft of or damage to your gadget, unauthorised calls and theft or loss of your e-wallet. Gadgets include mobile phones, iPhones, iPads, tablets, smart watches, cameras, Go Pros and laptops. ConsularAssist cover – (automatically included with Premier & Premier Plus) provides emergency assistance in situations such as your passport being stolen or if a member of your family at home becomes ill. ConsularAssist cover gives you the reassurance of knowing that even when you’re miles from home, help is only moments away, offering advice and support from Embassy-trained staff 24 hours a day, 365 days a year. Dedicated ‘Cruise’ cover (automatically included on Annual Multi-trip Premier Plus, available as an option with Annual Multi-trip Premier and Single Trip Premier and Premier Plus at an additional premium) – provides cover for missed embarkation following delay in travel; cancellation of a scheduled port visit following a change in cruise itinerary due to adverse weather or a change in timetable; cabin confinement following your illness and the hire or purchase of formal attire should your baggage be delayed by over 8 hours. ‘Business’ cover (available as an option on Premier and Premier Plus at an additional premium) – provides cover whilst travelling for your business or occupation. Includes hire or purchase of business equipment should yours be lost, stolen or delayed and replacement staff cover in the event of your illness. 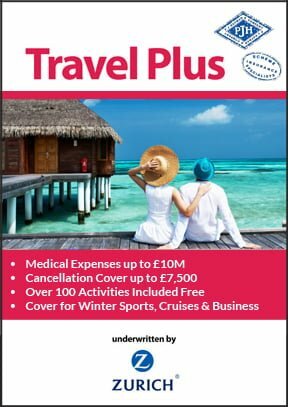 Travel Consumer Dispute – provides up to £10,000 with Premier (up to £50,000 with Premier Plus) for professional fees to pursue a compensation claim against a tour operator, travel agent, pre-booked car hire company, travel or accommodation provider. Emergency cattery/kennel costs – cover for emergency boarding expenses for cats or dogs up to £500 if the return home is delayed because of illness or injury. A wide range of activities are automatically covered under Travel Plus with Activity Pack 1. Additional activities (Activity Packs 2 – 4) may be covered on payment of an additional premium. Click here for further details. Winter Sports cover is automatically included on Annual Multi-trip Premier Plus providing cover up to a maximum of 45 days during the policy period. It is available as an option at an additional premium with Annual Multi-trip Premier, providing Winter Sports cover up to a maximum of 17 days during the policy period. With Single Trip Premier and Premier Plus, Winter Sports cover is available as an option at an additional premium. An online medical screening service is available during the quote process for those who have an existing medical condition. In some cases an additional premium may be required. Alternatively, please call us 02392 419 070. We are open Monday to Friday 8am – 6pm, closed bank holidays. 89 years or under at the date you purchase the policy for either Premier or Premier Plus. If you are aged over 89, you can get a quote via our Free Spirit product that has no upper age limit. 85 years or under at the start date of the policy for Premier and Premier Plus cover. The maximum duration of any single trip is 94 days, which is reduced to 35 days if you are aged 75 and over at the time of purchase on Premier and Premier Plus. Note: If cover is required for longer periods, please go to our Longstay product which provides cover for single trip travel for periods up to 18 months. Premier & Premier Plus covers individual trips up to 35 days maximum, with an option to extend to 45 or 60 days per trip if you are aged between 18 and 69 at the start date of the policy. Available to UK, Channel Island and Isle of Man residents who have their main home in the UK and have lived in the UK for at least 6 months or hold a valid British residency permit or visa or are a British member of Her Majesty’s Armed Forces stationed overseas and are registered with a UK medical practitioner and are liable to pay taxes in the UK. Last updated: 9th January 2019. Visit website or call 02392 419 070 Mon to Fri 8am – 6pm.